Pink Guitar Farm | (Mis) Adventures in sustainable rural farming from the perspective of a city girl. We’re going to do some Before and After pictures here so that when Spring comes around next year we can refer back to our “lesson” lest we forget. BEFORE – BEFORE: Nothing fun here, just work, work, work. 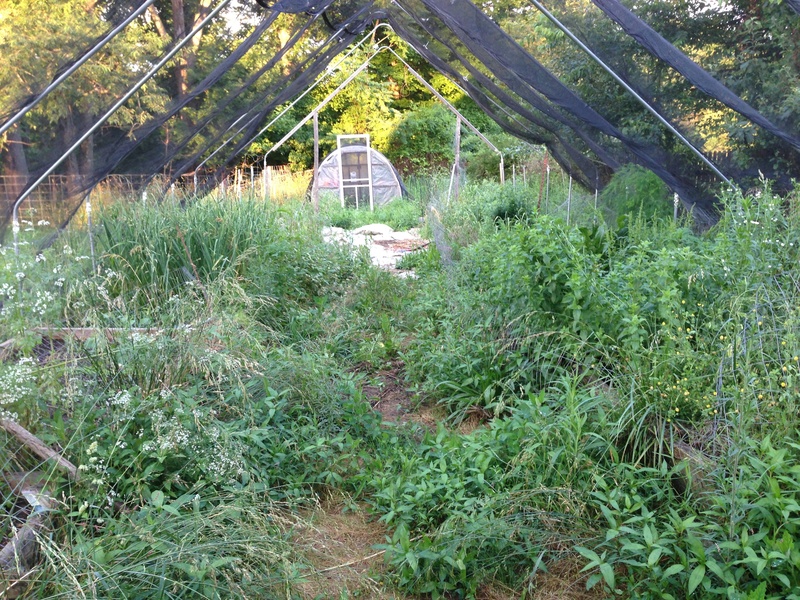 The door to the hoop house in the back? Yeah, there’s an example of measure once, cut – never mind. 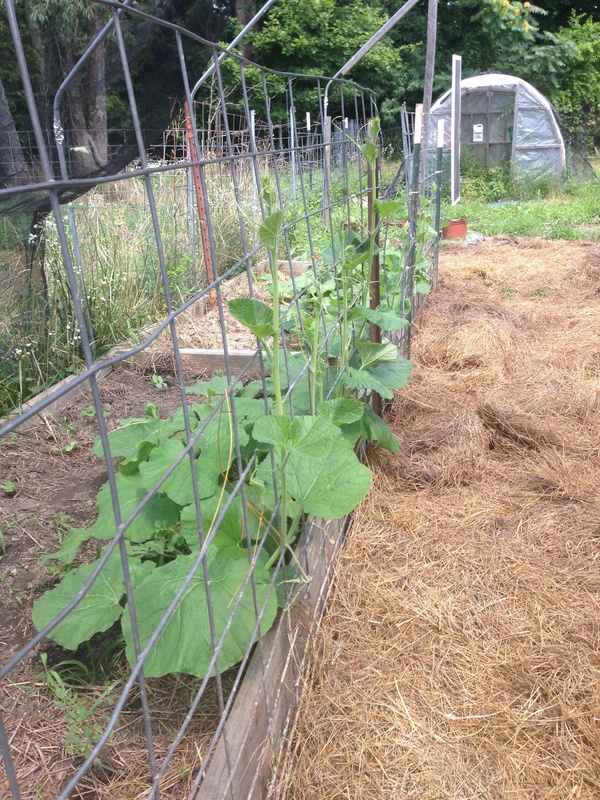 Springtime 2013: Pre-weeding, Pre-raised bed preparation and Pre-planting. Can’t you just taste those ripe tomatoes and squash already? Can hardly wait!!! 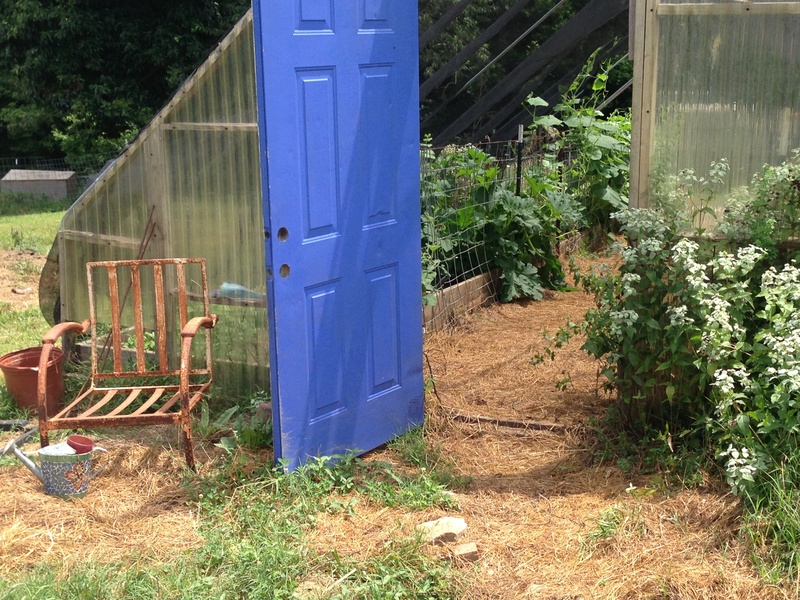 We even gussied up the front of the greenhouse area and painted the old door, so we could just hang out and relax. Cuz that’s what farmers who milk goats and work full-time do, they hang out and relax. 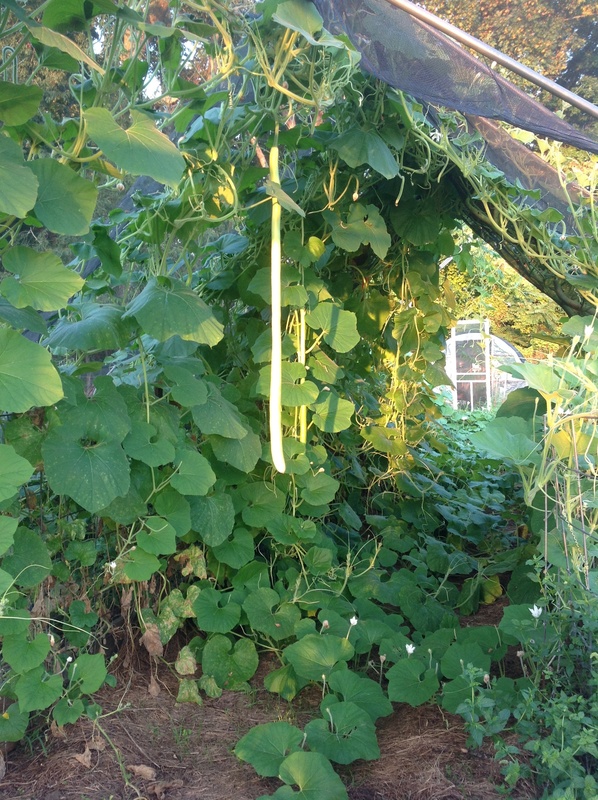 Since we are no longer pig farmers, this is not really what we would consider a wildly fortuitous, fabulously abundant crop. More of a pain in the neck, really. 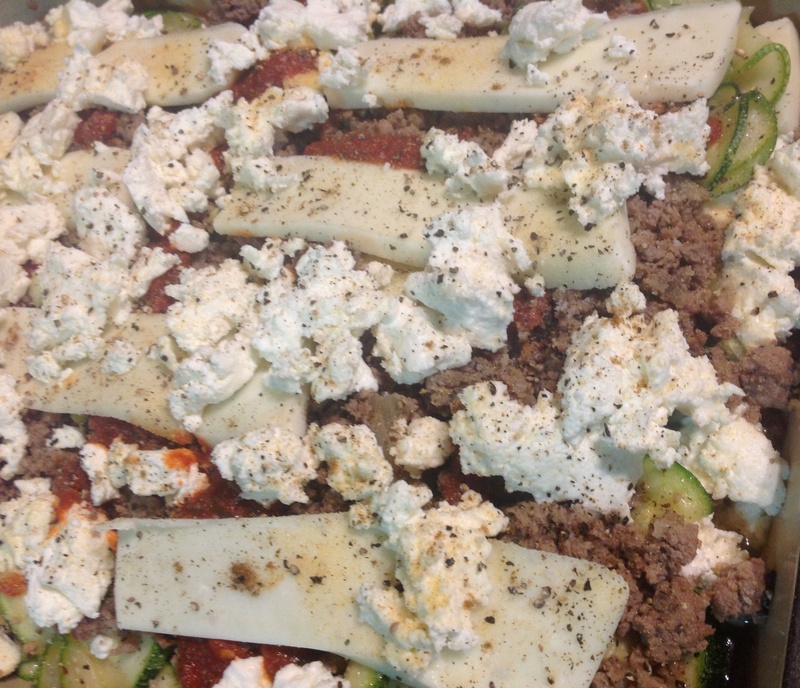 Although the smaller zuchettas taste great sliced thin and cooked as the pasta in a pork sausage lasagna with chèvre, goat mozzarella and marinara (marinara from last year, mind you as this years crop of tomatoes had a little – ahem, competition for sunlight). Squash lasagna with pork sausage, chèvre, goat mozzarella and marinara. Prior to cooking. So what to do, what to do. The goats are NOT interested in eating this forage. did I mention there are no pigs around? A local artist’s impression of the fact that there are no more pigs on the property. One of my good friends who I actually met through Craigslist (bartering goats for pigs, what else?) has pigs. He, and his pigs are the lucky beneficiaries of this forest of Zuchetta in addition to numerous buckets of whey from cheese making. 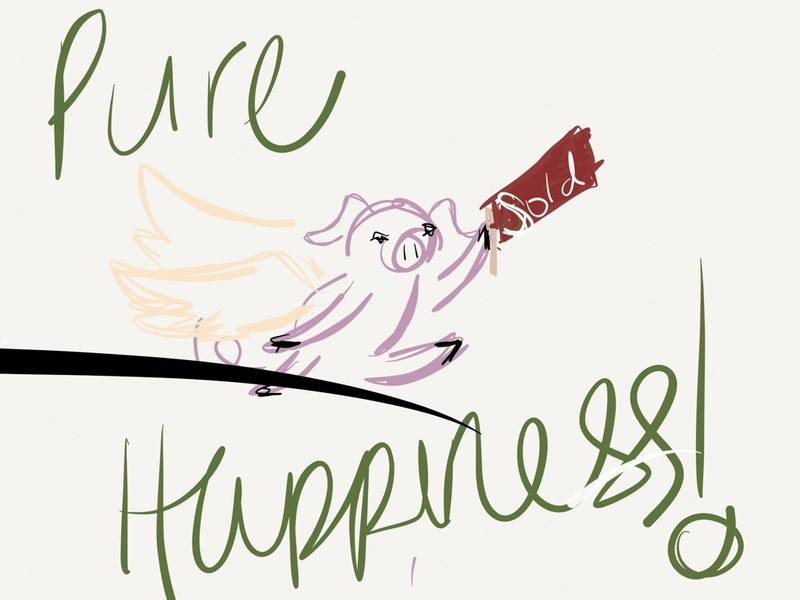 The other day, I was talking to the artist who rendered the pig picture above and she told me that when she grows up and purchases her own farm, she is going to raise pastured pigs. Wow. I guess dairy goats might be too much work for our budding farmer who is calculating having stout fencing in place, lots of silly greenery abundance and gallons of whey (read: free pig food) at her disposal from her parents that don’t do a very good job of remembering “lessons” on the farm. Momma didn’t raise no fool. 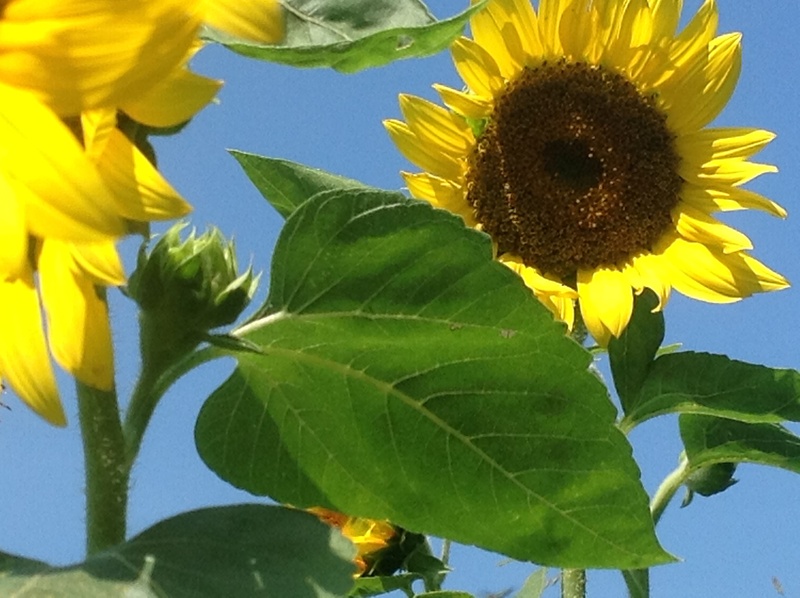 Sunflowers, planted by goats. 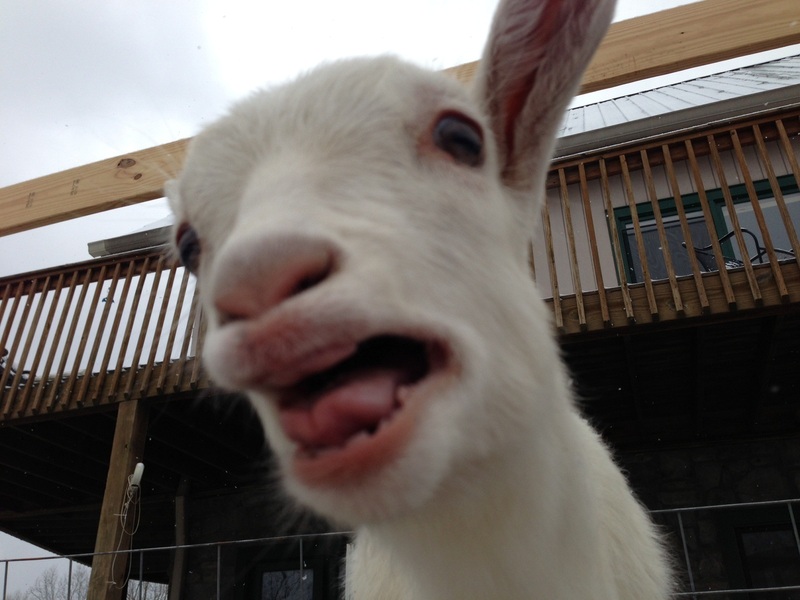 Goats who tossed their dinner bucket on the ground, which included black oil sunflower seeds. Maybe they ARE more work than pigs. Just because we love to farm using organic non-industrial methodologies doesn’t mean we reject technology wholesale, quite the contrary! We think the internet is the best way to share what we’re doing, how we’re doing it, learn how to do it better and to communicate what we have for sale. The internet is an excellent tool for those interested in buying local. We’ve seen this with virtual farmers markets, social media, personal/collective websites and forums. So where are we headed with technology and farming? Got a smartphone? Me too, doesn’t everyone? Got Apps? Me TOO! Introducing the PINKGUITARFARM App! You can download it here through iTunes. Want your own App? 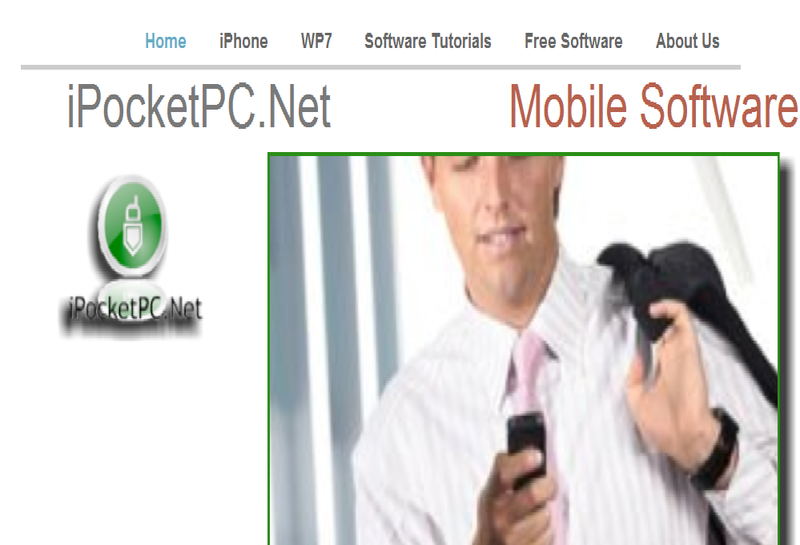 Contact the really smart and cool people at iPocketPC to get one for yourself! Contact them at Dolph_Larson@hotmail.com for a quote! Click here for the link to the article. This summer we are making an effort to walk our lactating dairy goats along areas that are accessible to humans but still provide abundant forage. Because we live rurally in a temperate rainforest, the difficulty lies in human accessibility rather than locating forage. 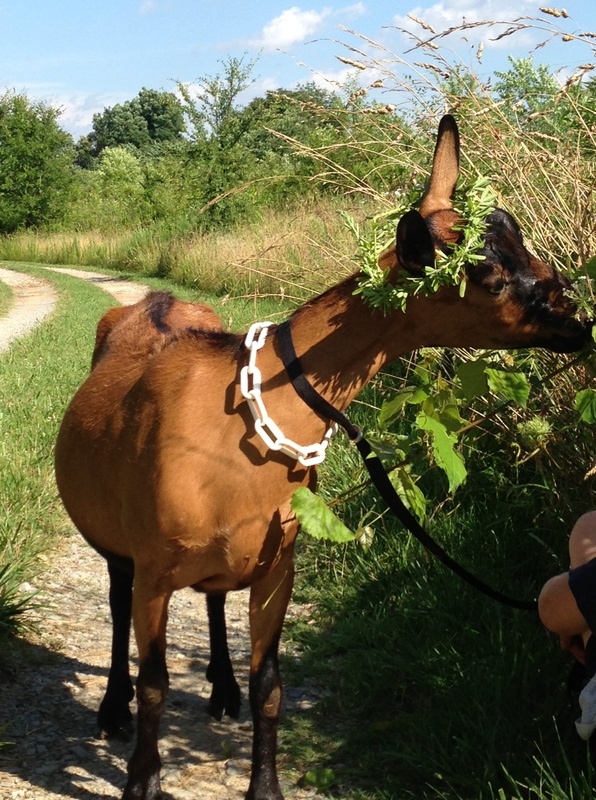 Simply put, our dairy goats help with brush control. 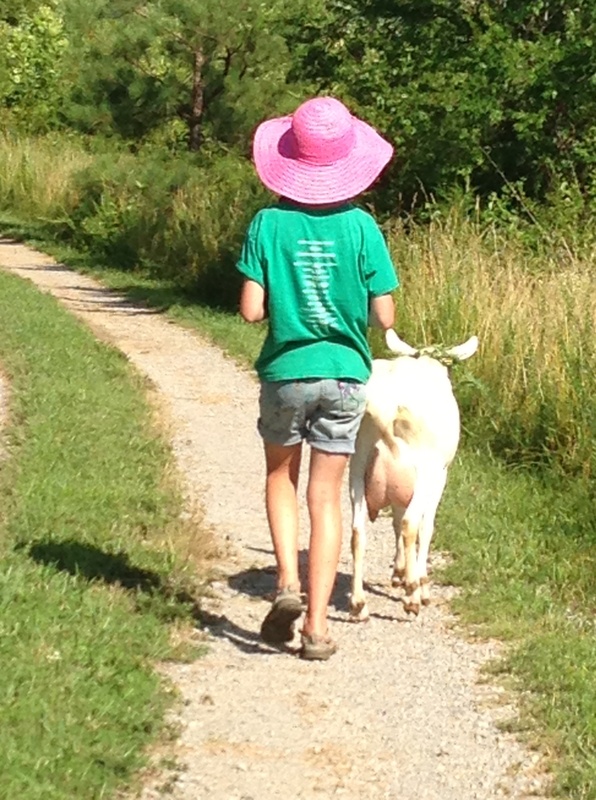 We have done quite a bit of research on feeding dairy goats to ensure healthy milkers. We are working on a management program that includes pasture rotation, chemical parasite control, correct protein feed levels, vitamin and mineral supplementation and fresh clean water at all times. 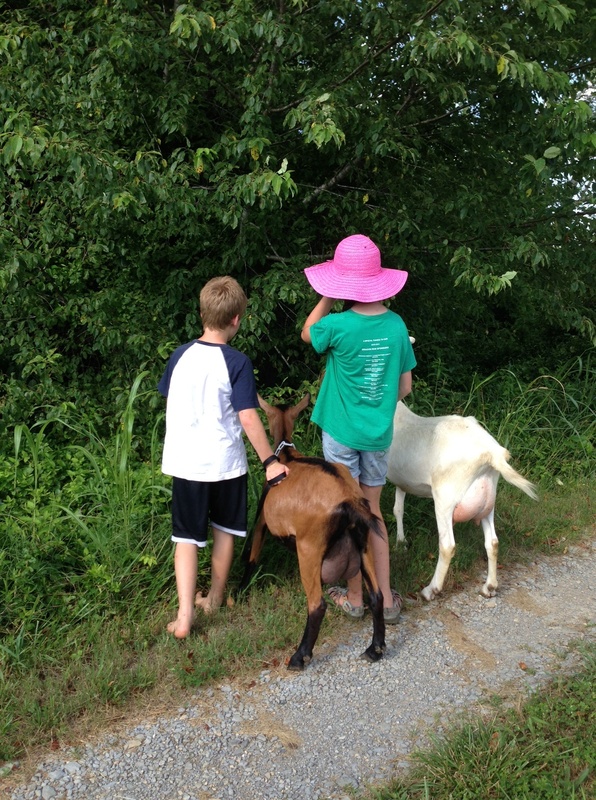 Just like everything else on the farm, our dairy goat feeding program is a work in progress. Our future goal is to implement as much browse as possible either as pasture/woodlot forage or through seeding food plots. One of the most intriguing plants is Sericea Lespedeza, which happens to grow abundantly here on the property as a weed. We even have enough left over to make goat garlands! Farming chores and animals wait for no-one, for if we are the least bit off schedule it gets LOUD around here! The chores must be done whether it’s raining, if it’s too hot, if it’s too cold, if we don’t feel well or even if we want to “pretend” we are suburbanite’s again with lazy unscheduled weekends. Every once in a while we steal a day away from the farm and though fun and carefree, it brings us back to the purpose, serenity, beauty and balance we derive from being home with the animals on our farm, our retreat – where we have followed our hearts and intuition. We are phasing out the porcine element and bringing in the Dairy Caprine element! Now that takes COURAGE! Something we would never attempt without Dr. Woordard’s oversight and expertise. 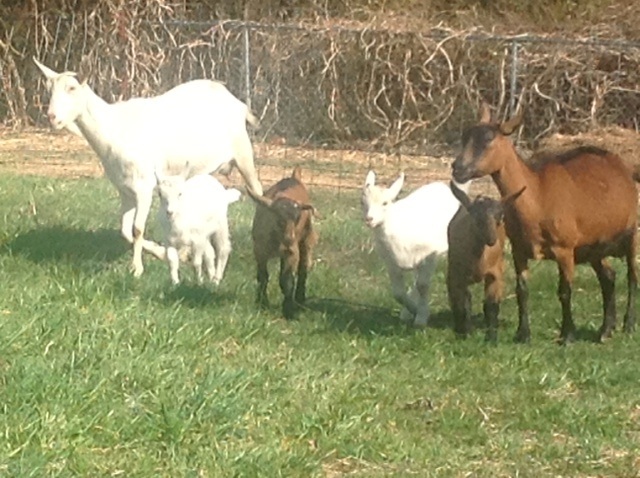 We have taken our time adding the right goats, searching for the best milking bloodlines we can find. Although we love all breeds of dairy goats and cherish our Saanen and Oberhasli does (amazing milkers as first fresheners giving us a gallon+ each, daily), our hearts are with the Nubian breed. Our search for Nubian bloodlines has brought us to the Saada, Goldthwaite, Six-M-Galaxy, POTF and Pruittville herd names. We will strive for large capacious, elegant does that are gorgeous and have long level lactation’s with milk, milk and more milk! Dr. Jamie Woodard, DVM may be reached at Woodard Equine Services, (615) 512-3557. Every Thursday is Open Mic Night at Pucketts in historic Leipers Fork! So you don’t live in Leipers Fork? Neither do I (though I wish I did for many reasons including some outlined in this article). I do get to visit a lot though, since we live exactly 13 minutes away. A few months ago we started showing up on Thursday nights…just because we’d heard the buzz about the shrimp boil, the fun and the amazing music. Once we finally attended an Open Mic Night our only regret was that we’d missed so many! I knew that at some point I would preserve duck breast (duck prosciutto) as a part of the Charcuterie Challenge. 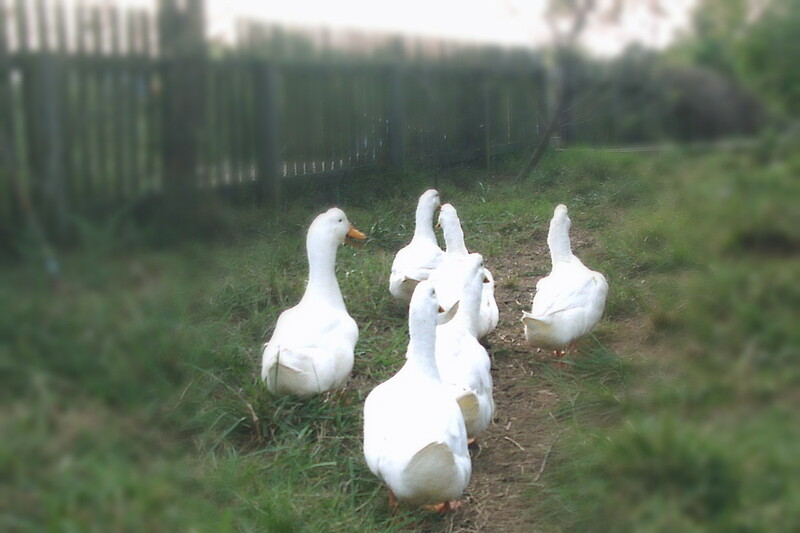 So to plan for the prosciutto, we purchased six ducklings last Spring, of whom we’ve become very fond. The kids picked them out at the farm supply store and since we read that the louder ones were female, the kids boxed up the most obnoxious quackers. This was challenging since the tornado siren was going off at the time in the area and locals were panicking (namely me). We have often wondered if this siren was a bad omen. Ducks are trouble, stinky and messy and better left to be raised by a mama duck than humans (in our humble opinion) problem is, we’re told Pekin ducks make terrible setters and not so great mothers. After our experience acting in the role of a mama duck, we decided we would never do this again! MESSY! However, we ended up with five female ducks and one drake and in keeping with the Pekin breed, all five ducks are laying prolifically. Therefore, no ducks on our farm were processed for this challenge. 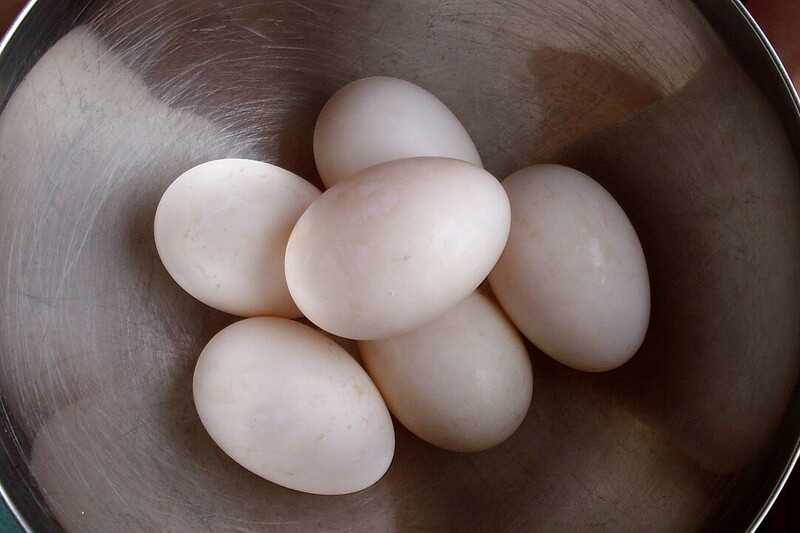 But we have duck eggs! For confitting, we sourced two whole locally raised ducks, already cleaned and plucked but with head and feet on. After cutting up the ducks for confit, we were left with parts for stock and breasts for something else (maybe prosciutto?). To cure them, we used star anise, white pepper, black pepper, Celtic sea salt, dried orange peel, black Nigella seeds, oregano, thyme, lots of smashed garlic and a few red pepper flakes. 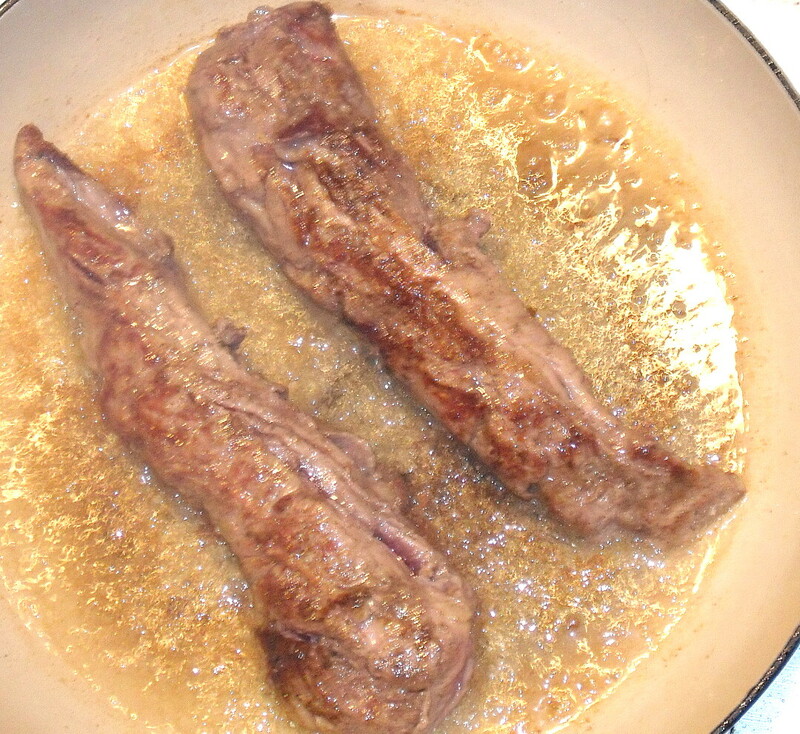 For the fat, we added coconut oil to cover the meat anticipating Asian flavors and spices for our ultimate recipe. 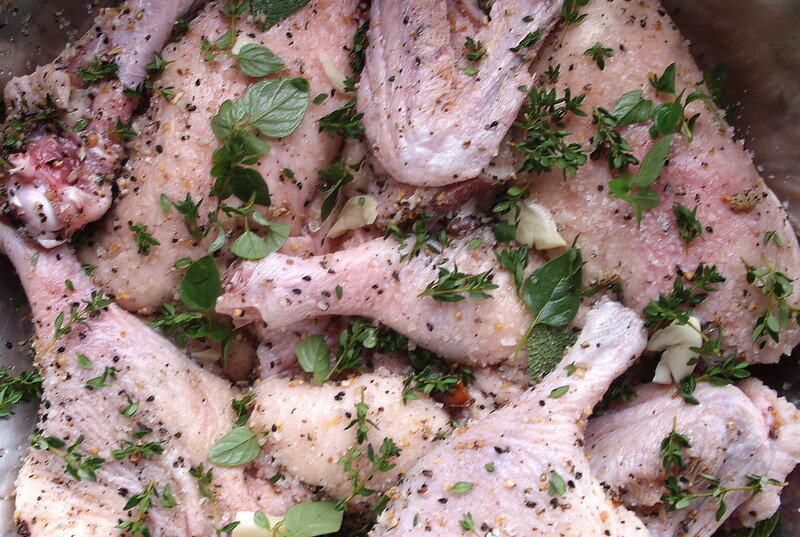 What we found out about confit(ting) aka preserving was that it’s easy enough to do during a work week. We cured at night before bed, left the meat for 24 hours in the fridge and then cooked the duck in the oven over low heat that second night, overnight, while we slept. It cooled in the early morning and was set in the fridge again, already encased in fat by the time we left for work. Our understanding is that the longer our duck sits in the fridge, encased by said fat, the better it gets. 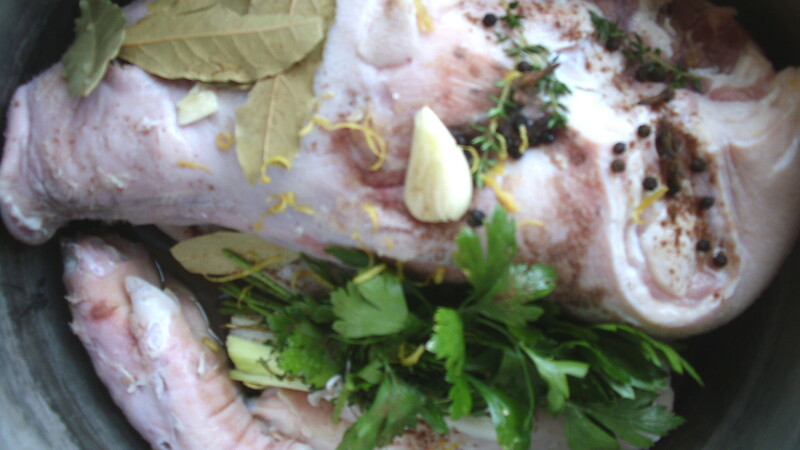 Today, we were ready to make something delicious with our duck. However first, we sought some inspiration at our favorite Vietnamese/Asian restaurant. We ALL love Spring Rolls, who doesn’t? Wouldn’t they be even better with duck instead of shrimp and pork and how about some fresh farm greens? After our extensive lunchtime “field research”, we still had a commitment. Mr. Pink Guitar was scheduled to lay down some drum tracks on an EP, a compilation of five songs that a friend was recording in Nashville, at Prime Cut Studio. 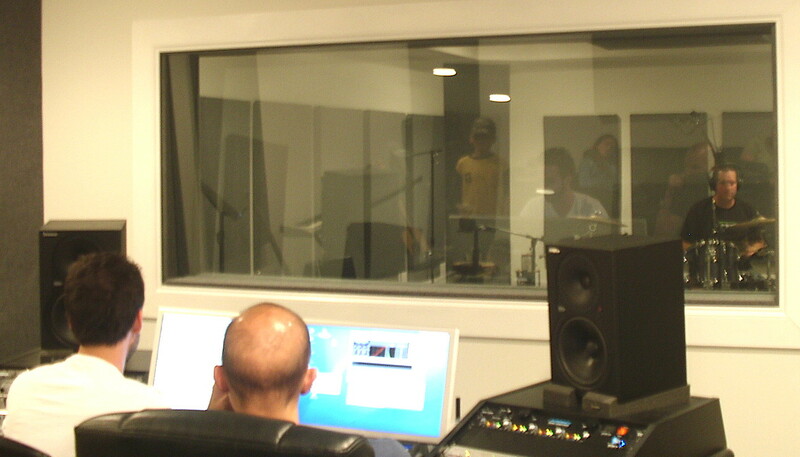 We thought it would be fun to hang out for a behind the scenes look at how an “album” is recorded. 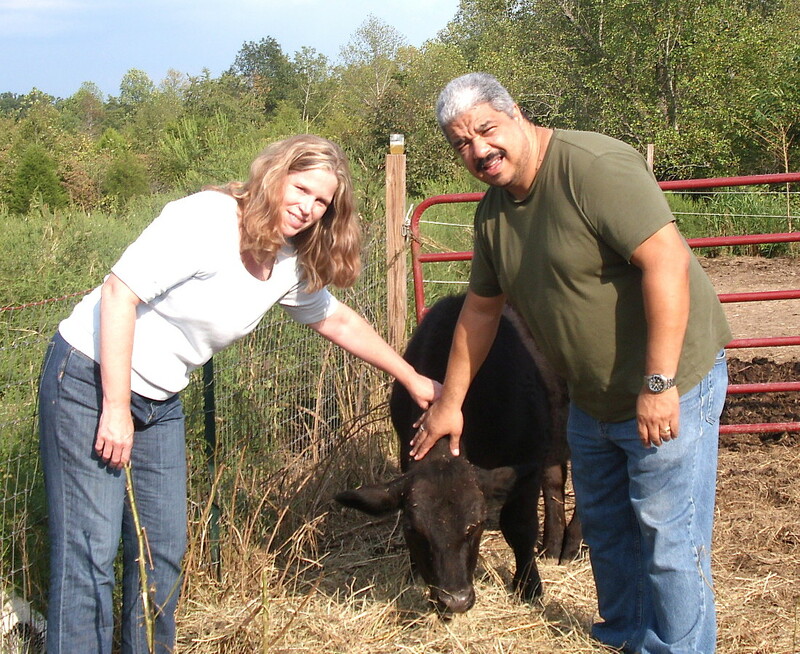 Then, it was home to the farm to feed animals and get dinner on the table. 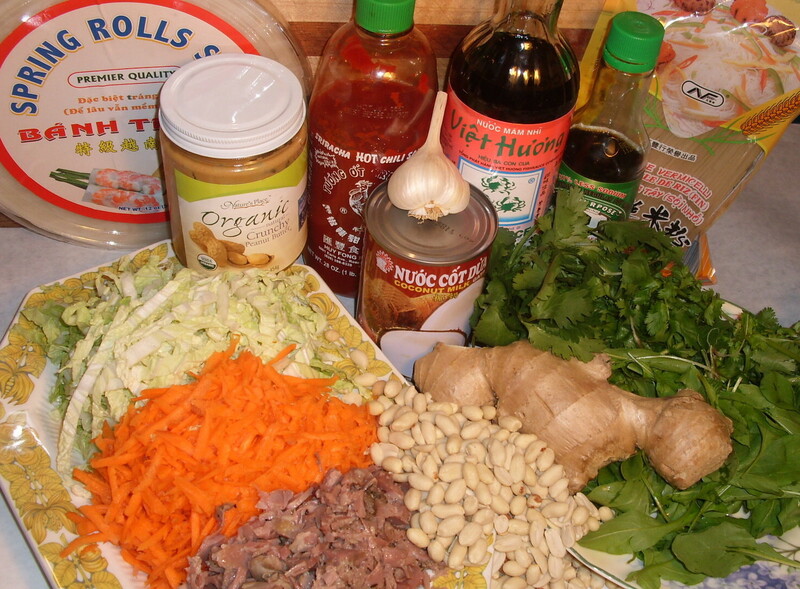 Dinner would be duck confit in spring rolls with a homemade peanut sauce. We were planning on crispy “wontons” of duck skin, one version of cracklins, but ran out of time. Most of the ingredients came from our Asian grocery store, we love our Asian grocery store. First of all, we can find all kinds of unusual things to cook with, and more importantly, the food is much more reasonably priced than our regular grocery store, a great way to cut down on the food bill. Mix all ingredients together except cilantro, add cilantro to the sauce right before serving. Our spring rolls are a little different in Middle TN. Bear with us here…we’re using home-grown greens. 1 package spring roll rice wrappers softened in hot water for about 20 seconds just prior to wrapping the filling. 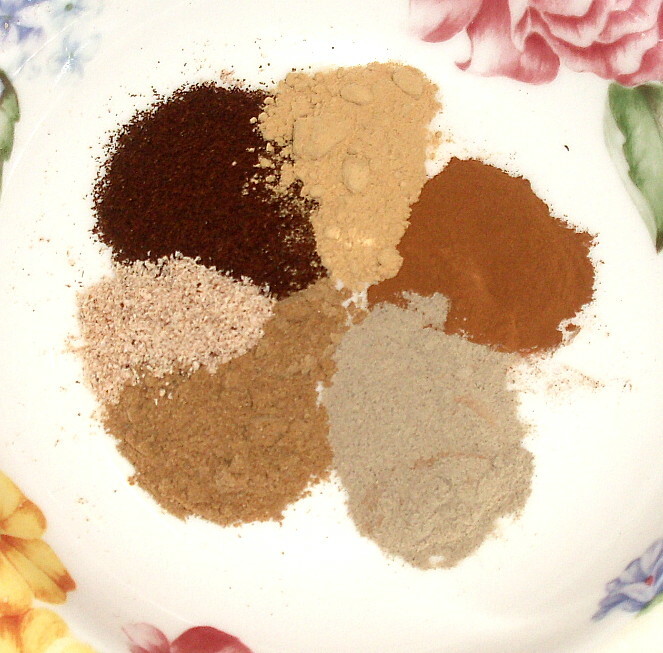 Mix all of the above ingredients together except the spring roll wrappers. Put about a 1/3 cup of the filling in the center of the wrapper and roll up burrito style. Dip in the peanut sauce and enjoy. When the charcuterie challenge was announced for September, I immediately went on-line to check out the fancy hinge-bottom pate pans. Then I saw the price, so I went to a local antique store in search of a hinged pan or something with similar dimensions that might be modified or engineered to work, in lieu of said expensive pan. You see, the trick of the pate en croute and the reason for the fancy pan, is that before baking, it must be flipped: allowing the seamless bottom of the pastry-encased pate to become the top (without tearing the dough) and exist as a perfect little package of browned smooth crust with spiced meaty goodness surrounding a little seasoned and seared tenderloin surprise. The local antique store (mall) has multiple dealers and in one booth, I found this cute little bread-pan. It was $8.00 and I was willing to pay that. When I went to purchase it, I was informed of the deal I’d gotten, it was a remarkable 75% off, so I owed two bucks. Well, heck yeah! I stopped the transaction and ran back to see what else I could find. Who doesn’t love a bargain? When the kids got home from school, I showed them my loot. Turns out, I’d been shopping at my son’s elementary school teachers’ booth. I informed Jack of this fact and what cool stuff his teacher had for sale. The next day at school, Jack told his teacher all about the deals I’d gotten (how his wacky mother cleaned out her booth). News travels fast when you’ve got an eight-year-old, huh? I’d wanted to ask my hay guy to weld a hinge on it (he’s also a welder and blacksmith in addition to holding down a day-job AND cutting hay) but hay season is in full swing so I had to figure out other ways to MacGyver the pan. After a few sleepless nights (yeah, kinda embarrassing, really) I was inspired by wax paper, which did the trick…well, for the most part. I’d like to get the “real” pan at some point in the future. Wax paper works for the flip, but gets stuck on the bottom so it has to be tediously peeled off the crust prior to serving. But I’m getting ahead of myself here, because what I REALLY wanted, was to share the charcuterie experience with some friends who were visiting from California and had been following the challenge through my monthly posts. I cannot think of a better way to make a tough recipe (that is quite INVOLVED), than to delegate tasks to willing, kitchen-savvy friends. Truth is, when you come to visit Pinkguitarfarm, we’ll put you to work; either in the kitchen or on the farm and if there was ever a recipe you’d want to delegate, this is IT. 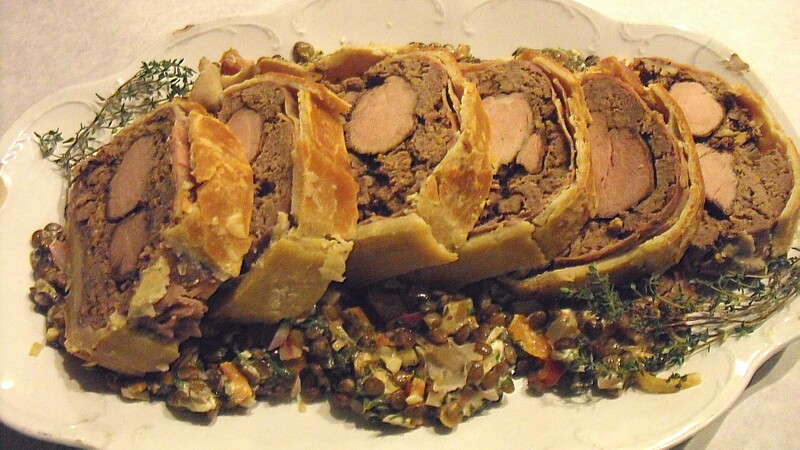 I have the best friends in the world, however, making this pate with them just didn’t work out like I’d hoped. We made other things that involved fewer steps and could be eaten right away. Frankly, I wouldn’t have it any other way. The food we ate over the long weekend visit included a spicy Thai pork/sweet potato/coconut milk dish over brown rice, pulled pork in a Louisiana style sauce with homemade stone-ground corn biscuits and a Napa cabbage slaw, then, the last day, some soulful greens with macaroni and cheese and a skinless fried chicken. It was a three-day eating festival of goodness and friendship, recipes to follow soon. All meat from Pinkguitarfarm! Did I say that we love having visitors? Especially when they cook every meal AND play with the livestock! After the long weekend, our friends traveled north to Louisville before heading back to Cali, and I assessed the pate situation. 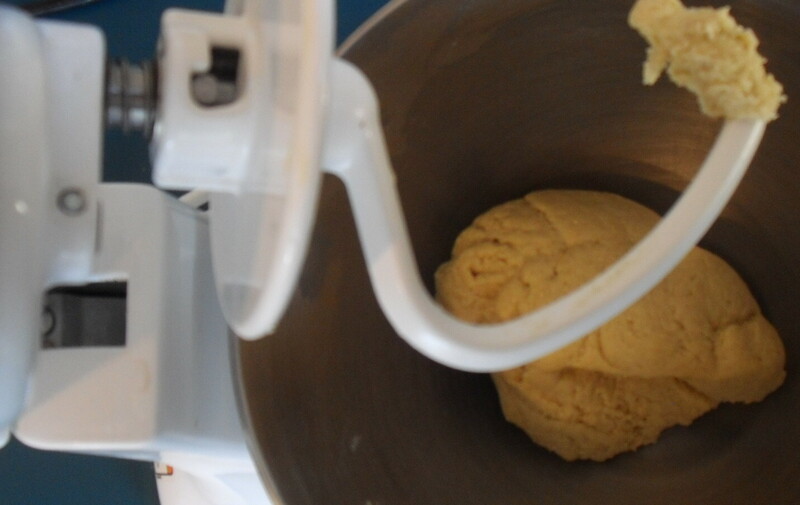 I re-read the recipe for the nth time and decided to develop a flow chart (too ambitious – not enough time!) opting instead for a detailed list, to help prioritize the tasks required in pulling this dish together. 3. Freeze blades and grinding tools. 4. Sear tenderloin(s)- mine came from a smaller pig so I used both. 16. Flip assembled, encased pate with COURAGE! 18. Pinch yourself, you are almost there! 24. 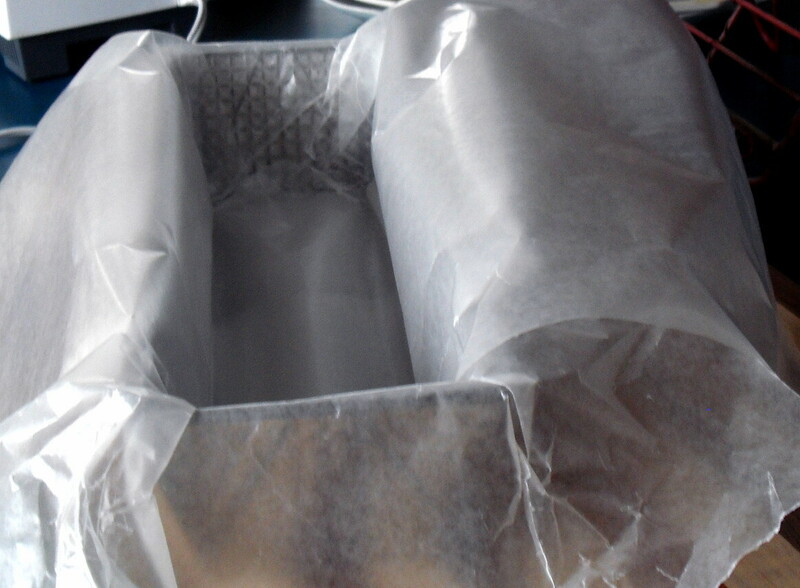 Allow pate to cool to room temp. 25. Aspic? No aspic for ME. 26. Refrigerate for 12 to 24 hours. I believe all of this prep, etc., took MORE than 3 days, but all told, give yourself at least that much time – unless you are a pro, that is. I asked my daughter Sophie what she would like to eat with the pate. This was while it was cooling out of the oven after the first baking (of two). The kids could hardly hold themselves back from the smell of rich, cooked pork and browned pastry mingling with aromas of cloves, nutmeg, ginger and cinnamon. It was just too much to look at the pate in the pan cooling, it was way too tempting, even for me! And what a let-down to be informed that, for dinner, they would be eating boring old pasta with tomato sauce. They protested that the smell should match the dinner and they are correct. My bad. With the pate BACK in the oven for its second baking, I suggested a lentil salad and Sophie stated that she wanted it WARM. Okay then. 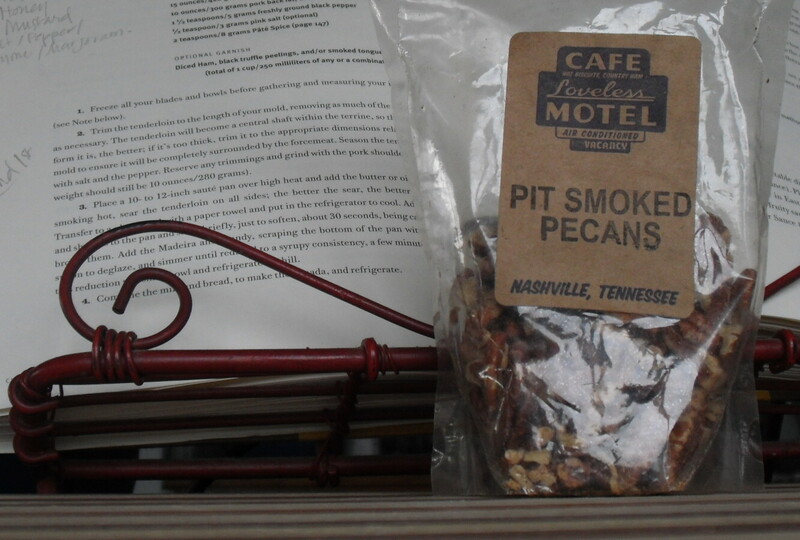 Warm lentil salad would accompany the cold meat pate and the pate would also be externally garnished with minted peaches to compliment the internal garnish of “pit-smoked pecans” from the Loveless Café (a gift from our friend Cam). Thank you, Cam! Mix the first four ingredients together in a saute pan with the vinaigrette (see recipe below) and cook over low heat until just heated through. 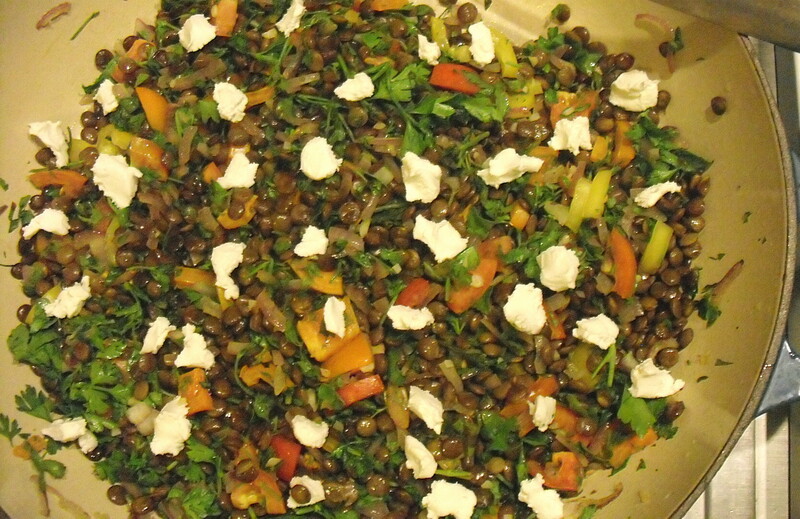 Dot the lentils with goat cheese and stir until goat cheese melts into lentils. Add salt and pepper to taste. Serve immediately. Combine all of the vinaigrette ingredients in a mason jar and shake it up. 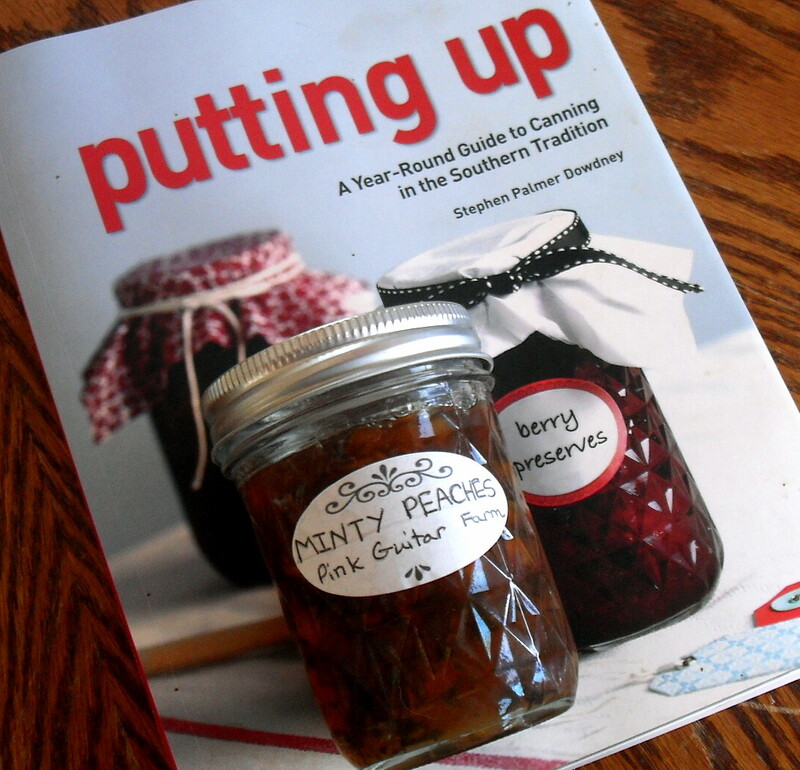 Minted Peaches were made using a recipe from the “Putting Up” book by Stephen Palmer Dowdney. We made them earlier this summer from a bulk order of peaches purchased through a local food coop; and the mint came from our garden. 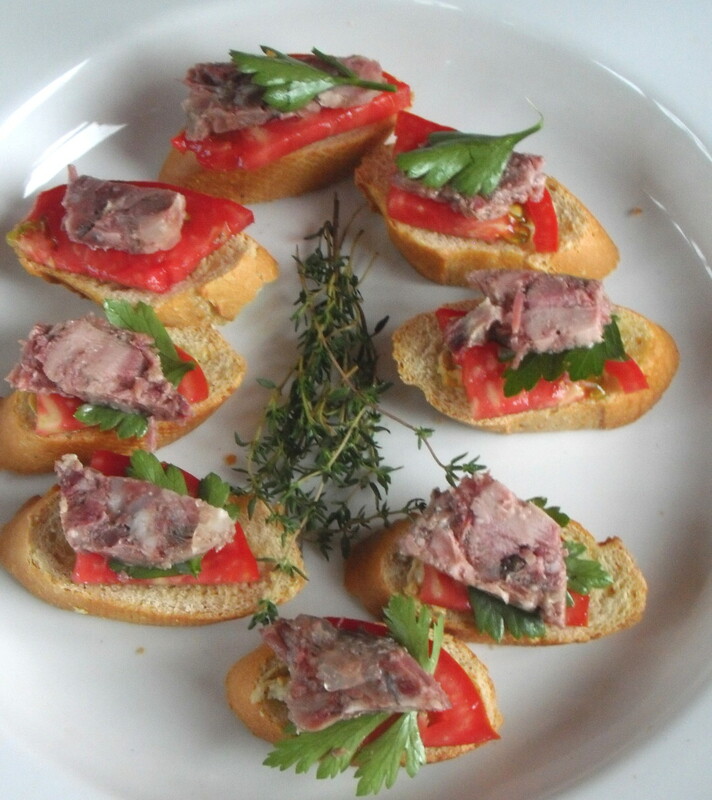 When I think of a pate like this I wonder if it was something originally created in a rural farm kitchen with extra ingredients and leftovers or did a talented chef conjure it up in a famous restaurant? 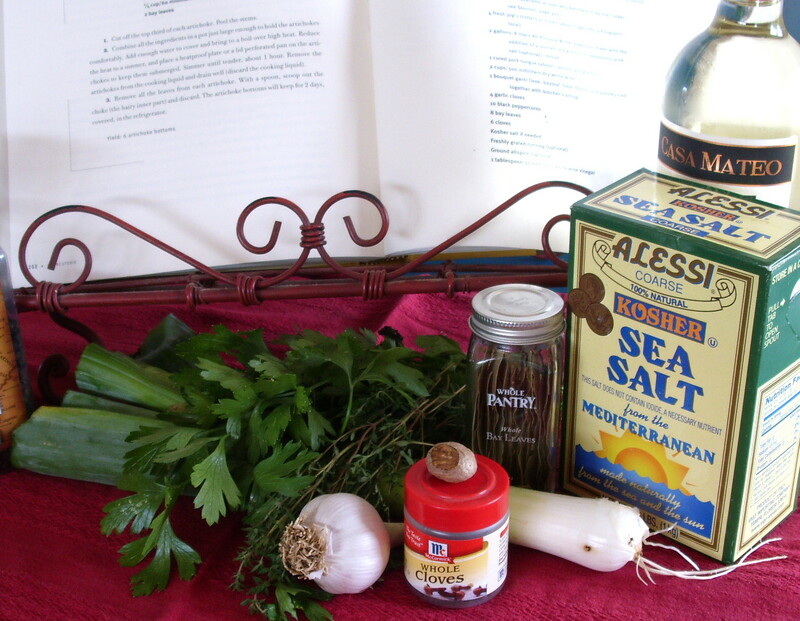 The more I cook food from the farm, the more some of these French and Italian recipes make sense to me. In other words, unless I raised pork I wouldn’t have the tenderloin, shoulder and back-fat on-hand just sitting in my freezer waiting for the alchemy of such a recipe. Also, I doubt I could afford to purchase these items (or if I could find them humanely-raised) and would be reluctant to put tenderloin in a meatloaf covered in dough. I would simply cook it to stand alone as tenderloin by ITSELF. One of the things I realize about European cooking is that recipes with mixtures of meat types and varieties are commonplace and must have originated from having access to many parts of the animal, different kinds of animals, and creatively using them…up. Bon Appetit, indeed! Meanwhile, I’m off to visit the antique store again to see what other treasures I can find to make and serve my farm food with! Sunday afternoons at Layla’s Bluegrass Inn just won’t be the same for a while. Why? Because Todd Bolton doesn’t play his regular show downtown from noon to 4pm during football season (from now until mid-February), as he puts it “70,000 people are 3000 yards away, and in front of Layla’s…tumbleweeds roll down the street”. Layla’s Bluegrass Inn is a place where we have spent quite a few Sunday afternoons recently. Mr. Pink Guitar supports the farming operation at home and we support Mr. Pink Guitar when he has a gig with Todd. Luckily Layla’s is a family friendly venue and kids are welcome to watch music during the daytime shows. Layla’s is a special place to us, a reprieve from the country and the endless farming chores where ironically we sit and listen to songs about living in the country and doing endless farming chores. 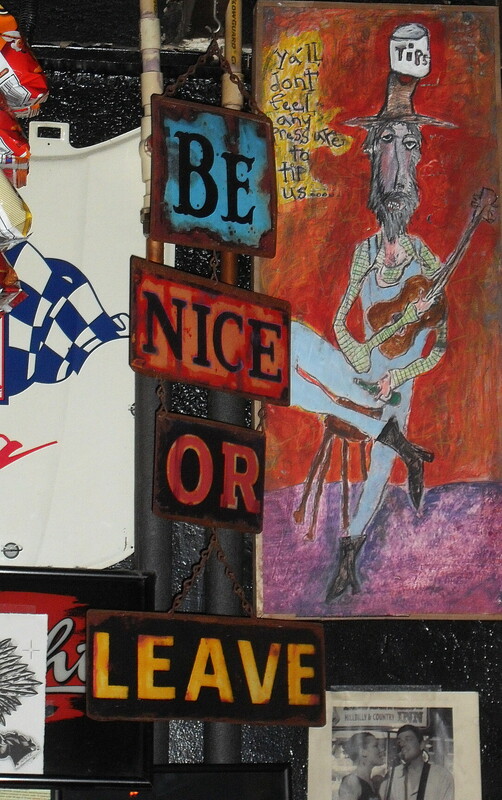 Just a gentle reminder to patrons… this picture was taken over the bar register at Layla’s. We happen to agree with this philosophy, it’s our farm philosophy too. It applies to dangerous momma pigs (sows) as well as extra-aggressive roosters, except the phrase might be better stated as “Be nice, or you will be eaten”. All of the breeding stock on the farm, especially the pigs need to be kind and gentle animals if not, they’ve gotta go. Since our kids hang around the farm and help with chores, this is imperative. There are a few videos on this blog of Todd Bolton playing some of our favorite songs. Todd is a good friend who has spent time at Pinkguitarfarm. In fact, he was the first person to greet us when we rolled up to the house after our long exodus across the U.S. arriving finally to TN. It might be true that we chose to move to TN because of Todd. Todd and Mr. Pink Guitar knew each other in high school. They played some decent shows out in California together way back when, even opening up for the likes of Waylon Jennings and Merle Haggard. Mr. Pink Guitar will tell you that that was when they were young and good-lookin’. Todd is a good person to know if you live in TN and are interested in going fishing. 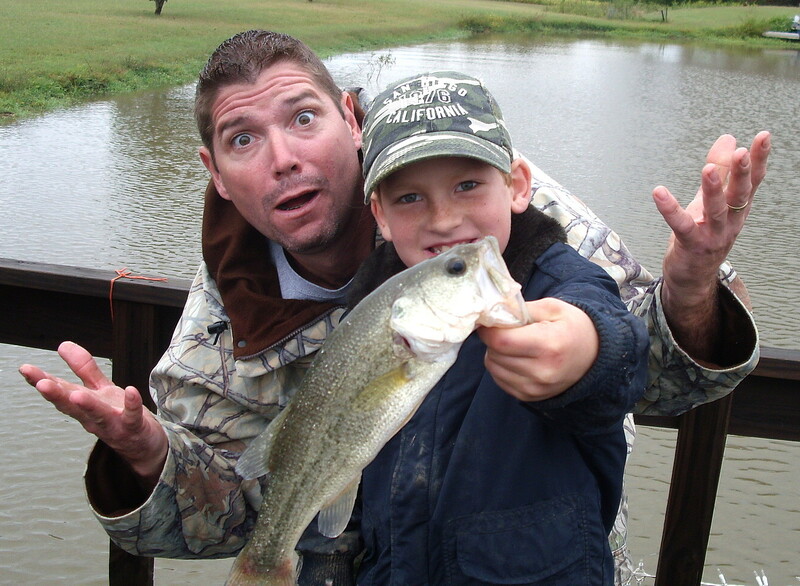 Jack has been asking about going fishing with Todd for a while and on Labor Day, Todd took everyone fishing for catfish to one of his secret fishing spots. Everyone caught fish! All kinds of fish! 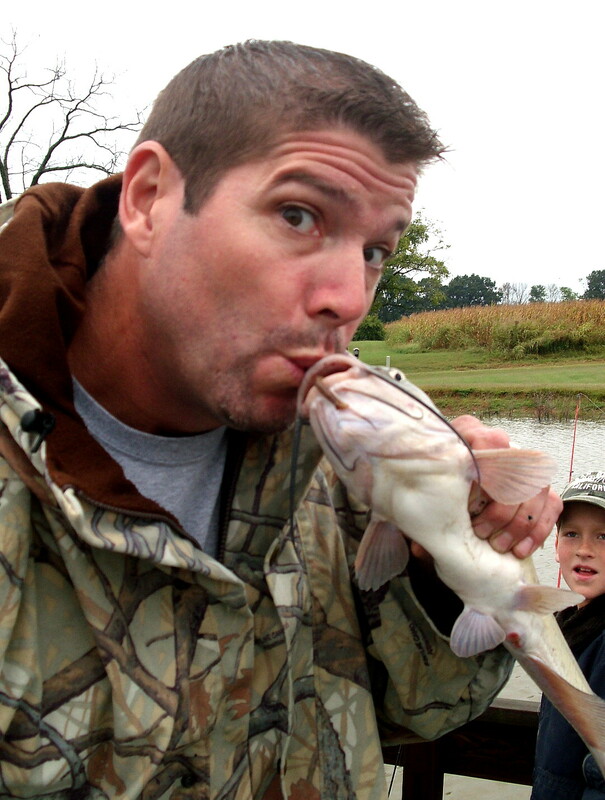 Todd brought one of his sons, Tucker fishing too. Tucker caught a turtle that was, according to Todd, “too small for kebobs”. Todd has a wonderful family, a very supportive and beautiful wife Jamie, and three amazing children. Todd is an avid hunter and has shot and eaten just about everything. What we respect about Todd as a sportsman, is the fact that he only takes what he can eat, he always shoots to kill, (not wound) and he is as humane as possible about it. In the fall, Todd will likely be out again to the farm to help us process some hogs – also in the most humane way possible. A country song is in here somewhere with regard to all of these experiences…maybe I need to attempt song-writing (I’ve sure got material). Come on out to see Todd’s show downtown in Nashville at Layla’s Bluegrass Inn on Sunday’s from noon to 4pm when it’s NOT football season. 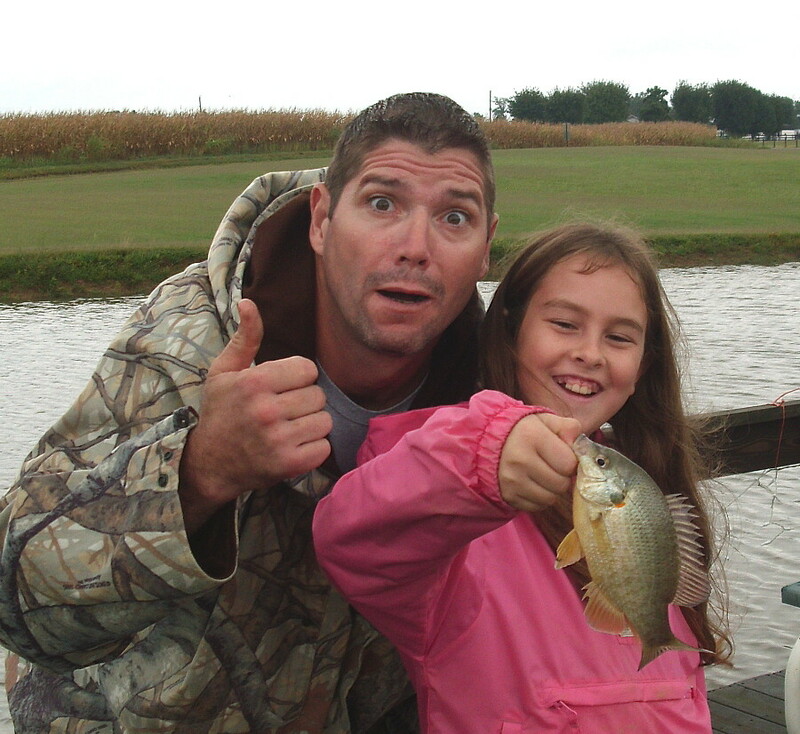 Frankly, Todd’s musical talents even exceed his wonderful fishing skills, you will LOVE his show! 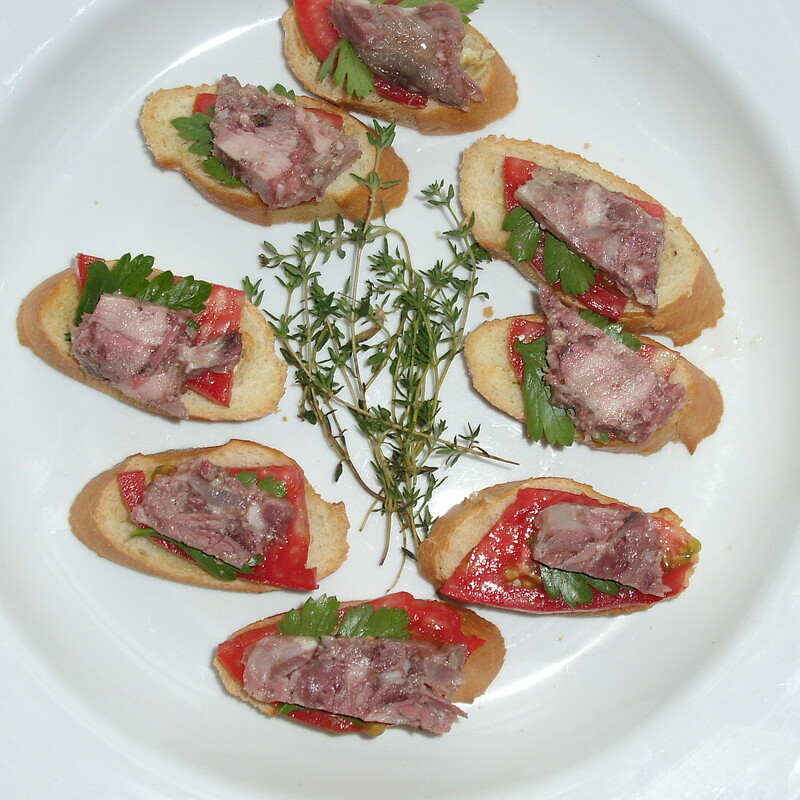 Shabalabashingo…aka Head Cheese, Brawn, Souse, Fromage de Tete, Testa in Cassetta, Coppa, etc., etc. This thing needs a new name! I told the kids and my friend Cam the day they were to be my kitchen tasters of the August Charcuterie Challenge: Head Cheese. My son said “call it Shabalabashingo!” with eight-year-old flourish and bravado. We all turned to look at him with amused interest and tried it on for size, hmmm. Let’s write that down. 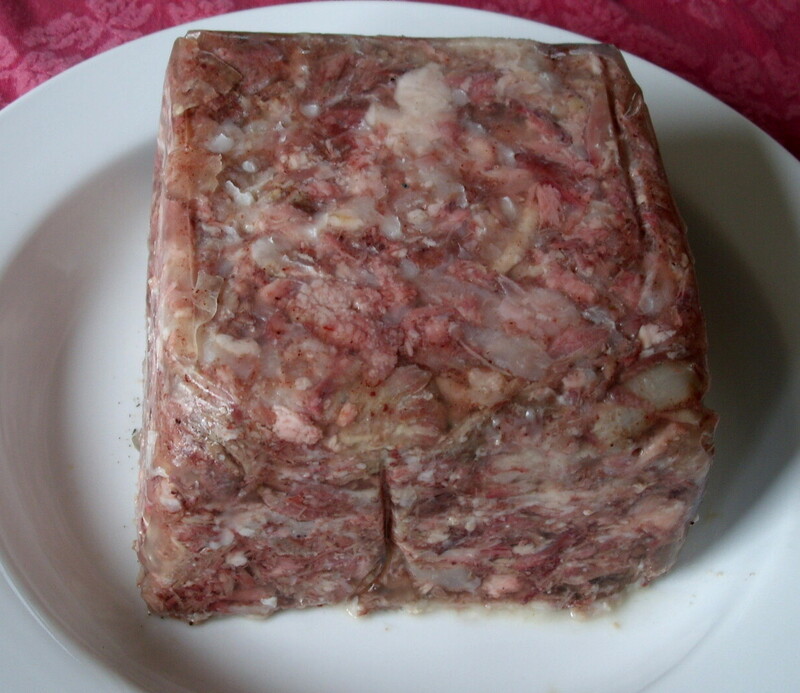 So in our household we now call Head Cheese or Souse, (as it is referred to here in Tennessee) Shabalabashingo. But before we got into the tasting part there was the prep part, like brining. Then cooking. Luckily, I had already completed these tasks. Initially, there was the issue of the head and 4 trotters to deal with which I had been avoiding for a while now – sitting wrapped in plastic and a white garbage bag in my kitchen freezer. Awkward. Awkward to move around and awkward to store. Not to mention how awkward it was when a guest at the house opened the freezer door and rooted around it, ignorant to the contents of the giant frozen “brawn in a bag”. I had saved it when I’d butchered a pig raised on the farm into primal cuts. The head and trotters likely a little past due on their “use by” date but what the heck? I do believe in using all parts of the hog even if it means there may be a little freezer burn on an item while I’m out looking for my courage to make it. So, already thawed out, (out of sheer necessity due to limited freezer space) I was thrilled when the Head Cheese challenge was announced; my timing was perfect if not telepathic. Here it is in the stock pot. If you are squeamish, look really fast or simply move on. I followed the head cheese recipe in The Ruhlman Charcuterie book. Everything went according to plan except my “terrine” was cube shaped and I had to use a zip-lock bag instead of plastic wrap. This made for a blocky less than smooth presentation, but did the job. Well, it is a peasant dish, yes? It doesn’t have to be pretty. I thought it would be tasty with crusty bread. So I bought a baguette and had my friend Cam slice it on the diagonal. 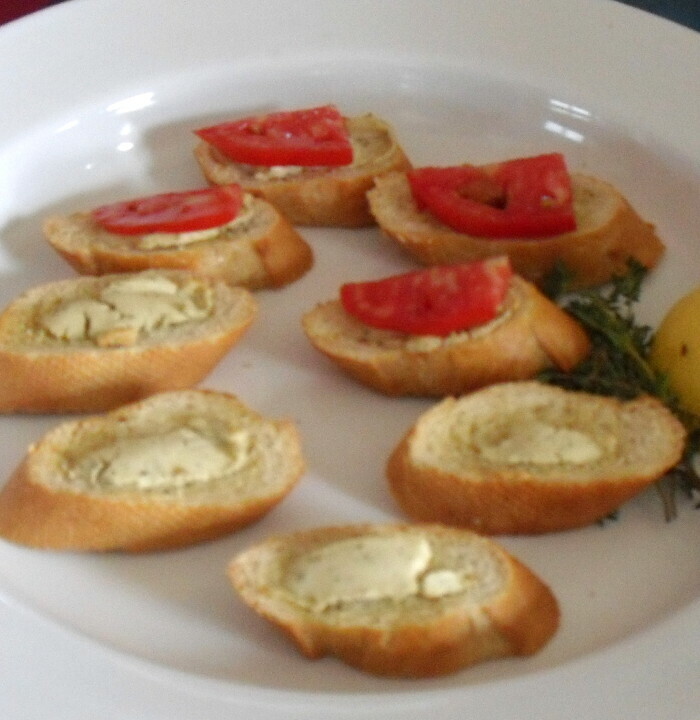 Then we drizzled some olive oil and spread it with seasoned goat cheese and broiled it until just crunchy and a little brown. I didn’t really have a recipe, I was just going by what I thought would set off the “Shabalabashingo” in its best light, texture and flavor. The tomatoes have been obscenely tasty this year – my best year growing tomatoes…EVER. So I sliced a few heirloom Italian tomatoes over the goat cheese and then turned to my daughter to see if she would be willing to pick some fresh flat leaf parsley from the garden. My daughter loved it. She has now requested it numerous times and that’s a good thing because I think this recipe could make about 100,000 little crusty goat cheese, tomato, parsley, peasanty Shabalabashingos! I froze it. So actually, it’s back in the freezer just in a smaller, denser less shocking and now edible format. It really was a hit, even my friend Cam said she liked it… come to think of it though, she hasn’t been out to visit the farm since. 😦 We were all pretty brave that day, even my son, who dropped his on the floor and promptly instituted the 5-second rule. He liked it but only had one while the rest of us finished off the plate. I suppose for my son, it was enough to come up with a new marketing strategy for Head Cheese by changing the name for us. There are undoubtedly some more dishes out there that he could “modernize” in hip, eight-year-old parlance.